A "Passive House" is a home that has been built to exceed the highest standards for energy efficiency. Following this standard results in a ultra-low energy building that utilize a variety of elements to drastically reduce its ecological footprint. Buildings modeled after this concept save 60-80% compared to ordinary, code-compliant buildings. Harnessing sunlight, thermal energy, and air flow, "Passive Homes" are intelligent structures that work symbiotically with the Earth and its elements. There are many design components that compose a passive home. 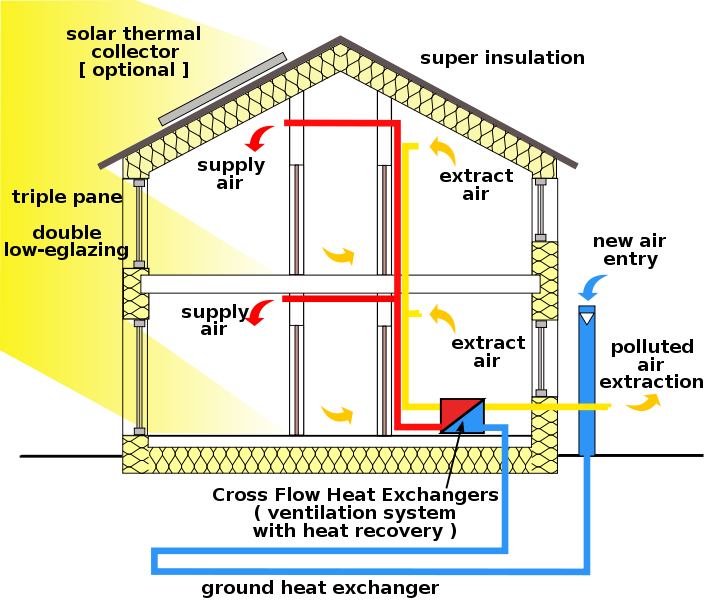 A Passive Solar design collects heat from the sun with south-facing windows and an internal thermal mass. Superinsulated walls, floors, and roof, coupled with advanced window technology provide protection from extreme temperatures and efficient heating and cooling. Heat exchangers replace inside air with fresh, HEPA filtered air, simultaneously heating or cooling the house. Aerodynamic interior design utilizes convection to direct the flow of fresh air throughout the house. Lights are LED or a high-efficiency alternative, powered by solar where possible. Appliances are chosen selectively. Passive homes enable us to live comfortably, in harmony our planet. Complete and unbroken thermal envelope. This means eliminating all thermal bridging of structural elements with a continuous layer of insulation and the use of high performance windows and doors. Air exchange through a high efficiency Heat Recovery Ventilation (HRV) system, to remove stale air and introduce fresh air with little energy loss. High efficiency mechanical systems, appliances, and electrical fixtures. The air barrier also originates below the slab as a 15 mil vapor barrier, sealed and taped to the perimeter and penetrations, ventilated by a passive radon vent. SIP panels are individually air tight but, where they are joined, there is potential for air movement. The walls were sealed with specialized building tape on the interior seams and over joints of dissimilar materials (concrete to wood). On the exterior, we supplemented the air barrier with a liquid applied vapor barrier over the SIP panels. For an effective air barrier, proper installation of the doors and windows is critical. After applying a liquid applied moisture barrier around any openings, we placed the windows toward the center of the wall line and intentionally left space for a ¼” bead of specialized “air dam” caulking to seal the unit into the opening. We then taped the seam between the wood frame of the house and the window frame, completing structure's efficient air seal. To manage air quality, a Heat Recovery Ventilator was installed. The ventilator we chose operates at an incredible 84% efficiency. This unit efficiently heat exchanges outgoing air with incoming, then delivers it at a slow but constant rate to living areas, and removes air from the wet and odiferous locations, such as the laundry, bathrooms, kitchen, creating a "clean-air" circulation throughout the home. With belief the future points toward solar as the primary source for power, we emphasized the use of high efficiency electric appliances such as an induction range and condensing dryer. To supply heat, we chose electric mini split heat pumps, arguably the most efficient form of heat generation. The only gas appliance is a tankless water heater. We prewired for PV solar on the south facing roof. Once the panels are installed, the potential is there for this home to completely offset energy from the grid. The location of this project afforded generous potential for passive solar elements. Using available software, the design process involved modeling the solar exposure for all seasons. This passive design maximizes solar gains during winter and minimizes them during the summer, enabling the home to draw most of its heat from the sun. Combined with effective insulation and super efficient design, this home provides a space that is comfortable, aesthetic, and amazingly functional.